Turus Mara ('Sea Journey') operate from a spot called Ulva Ferry on the west coast of Mull opposite the island of Ulva. Courtesy bus available from Tobermory. Cruises to Staffa, Treshnish Isles and Iona. Telephone 01688 400 242 or freephone 08000 85 87 86. A full package of coach/ferry/cruise is available from Oban - contact the Caledonian Macbrayne Tourshop in the Ferry Terminal Building, Railway Pier, Oban (tel: 01631 562244). Boat trips to Staffa are also available from Iona and Fionnphort at the far south-west tip of Mull where the ferry goes to Iona (you can get the bus from the ferry terminal at Craignure). The Kirkpatricks have a boat called the Iolaire which leaves Iona at 9.45am and 1.45pm, then picks up people at Fionnphort at 10am and 2pm before sailing to Staffa. 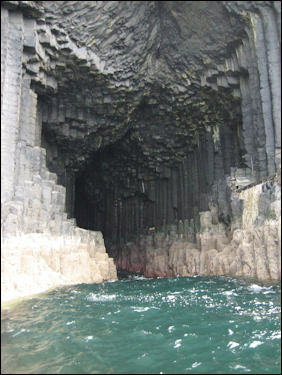 The trip takes 3 hours and allows you at least 1 hour ashore on Staffa. Tel: 01681 700 358. Gordon Grant Tours has cruises to Staffa and the Treshnish Isles from Fionnphort (Mull), from Tobermory (Mull) and from Kilchoan (Ardnamurchan peninsula). They also offer a variety of combined coach & boat trips departing from Oban which can include Mull, Iona, Staffa and Treshnish Isles. Tel: 01681 700338 / 01631 571112 / 01631 562842. Online booking available. All these trips are well-advertised in Oban and on Mull. You should book in advance as they are very popular. They will probably operate daily (depending on the weather) from Easter to September. Sea.fari Adventures (Oban) offers a direct service to Iona from Easdale (south of Oban) by rigid inflatable boat (with cabin seating) in just 75 minutes. This 6-hour trip allows ample time ashore on Iona, plus a non-landing trip to Staffa (Fingal's cave). Tel: 01852 300003. 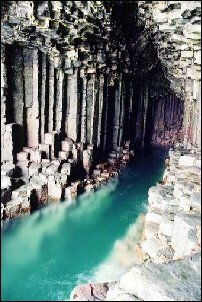 For those of you out there who are interested in movie trivia, you might like to know that Fingal's Cave apparently featured in the 1971 film When Eight Bells Toll. Staffa is owned by the National Trust for Scotland and was declared a National Nature Reserve in September 2001 by Scottish Natural Heritage. On Midsummer Day 1993 I took a boat trip from Mull around Staffa and the Treshnish Islands. Ulva Ferry amounted to no more than a couple of ramshackle old buildings with a car park and a Portaloo. It is from here that a small motor boat ferries passengers over to Ulva where nature trails and a museum have recently been set up by the island's owners. On the wall of what looks like the former ferry office, a white wooden square can be slid back to uncover a red panel when the boat needs to be called. With the Sound barely over two hundred metres wide, the boatman on the other side can easily spot it against the white-washed building. We arrived in plenty of time for the 10.30am sailing and so waited by the waterfront with a group of about twenty-five other tourists. Eventually a 45-50ft long, wooden boat chugged up to the jetty and a young girl helped everyone to clamber onboard, while the skipper tried to keep the vessel as steady as he could. Before we had chance to settle down, some sitting in the covered area, the rest of us opting for the exposed stern, we found ourselves already heading up the Sound. We rounded the eastern tip of Ulva, then followed its southern coastline, past the islands of Inch Kenneth and Little Colonsay. The shadowy hills of Mull dominated the scene, as the morning sun gradually burned off any cheeky clouds. After a smooth enough start, the going became harder as we reached the open sea and the boat began to roll. It was a good hour before we arrived at Staffa. The island rose proudly out of the sea as we approached from the south-east. 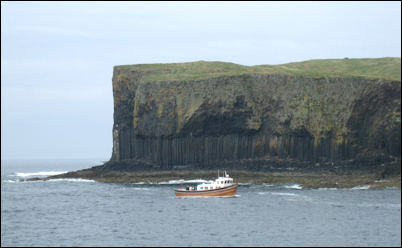 Manoeuvring the boat in front of the entrance to Fingal's Cave, the skipper played an extract from Mendelssohn's Hebridean Overture. We came as close as you possibly could to actually sailing inside, mere metres from the tightly packed rows of pillars. 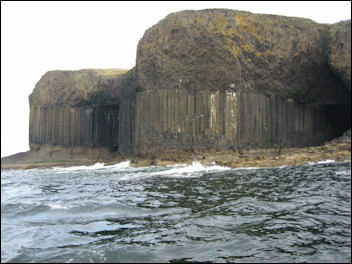 Topped with a rough mixture of stone peppered with yellow lichen, the tall, blackish columns give way to a ring of washed-out grey marking the high-tide line, below which the rock colour slides into a warm brown. The boat then pulled well away from the island to reveal the full extent of The Colonnade or Great Face by the lesser known Boat Cave. Turning around, we headed down the east coast, parallel to The Causeway and landed near Clamshell Cave. With strict instructions to be back by 1pm, we were helped off one by one onto the recently constructed jetty. Wary of slipping on the rocks, Betty and Jim climbed the aluminium and concrete stairway to the grassy flat top of the island where they planned to have lunch. I, however, wasn't going to let the walk along The Causeway stop me from reaching Fingal's Cave. About half our party opted to give it a go and we picked our way over the mass of giant stepping stones. A handrail was fixed into the cliff where the column tops became particularly uneven or narrow. In places I clung on to it tightly, unsure of my balance with a full rucksack on my back. We passed a group of American students sketching and basking in the sun. After two or three hundred metres we rounded the southern tip and reached the magical cavern. I did what you soon learn to do on these sort of trips - let everyone have their little gawp, get bored and saunter off to other things. I didn't think they would all stay too long, so within a few minutes I virtually had the place to myself except for a couple of people who decided to eat their lunch in a sheltered spot on the rocks outside the cave. As I filmed the sea view over to Iona, I could just make out the cathedral outlined against the horizon. The cave is entered by a narrow ledge of columns leading into the darkness. Someone came at me around the corner and I had to backtrack to let them pass. One false move and you would soon find yourself squirming in the gully of deep frothy water below. I waited and listened to see if anyone else was coming, then clung on to the rail to guide me in. I had been unsure as to what to expect, but this surpassed all my dreams. It was higher and deeper than I had imagined, but barely twelve metres across at its widest point. I was fascinated by the unearthly sounds filling the rear of the cave. Guttural utterances echoed around with the lapping of the waves. My eyes searched sixty metres into the semidarkness, trying to comprehend how such a noise could be made by water and rock alone. The back of the cave appeared as a stone altar strangely cloaked in pink. I fixed my gaze on it, waiting and willing for an answer. Watching the swell of the sea, I listened to the music, yet I couldn't fathom the origin of the sounds. The cave would not give up its secrets so easily. Perhaps it was Fingal speaking. Anything was possible in such an otherworldly place. Having sat there a good while, eating my lunch in coolness of the cave, I knew I had to leave. I felt as if I could have stayed forever. It had been a feast for all my senses, but there was so much more that I wanted to explore on Staffa. I picked my way back along The Causeway over the many-sided stepping stones and clambered up the stairway to the flat top of the island. I would have loved to have gone and stood over Fingal's Cave, but, with an eye on the time, I thought better of it and rushed across the neck of the island to film the views, picking up a couple of tiny black stones on the way. The mismatched group of the Treshnish Isles was strung out to the north-west, while Tiree and its golf ball radome could just be glimpsed on the horizon. Due west lay a vast expanse of ocean flowing all the way to America, the odd white peak of a wave whipped up by the Atlantic wind. To the south I could see sandy beaches lining the shores of Iona, then the great hulk of Mull swinging round a full 180 degrees, locked in a friendly embrace with the sea. From the low-lying Ross of Mull, rising up through the mountain ridges to Ben More, over three thousand feet high, the giant island filled the entire eastern vista. Ulva, joined to its sister Gometra, nestled in its curved arm. I looked down over a host of rocky coves, known as Port an Fhasgaidh in Gaelic or Shelter Haven. This was the Old Harbour, where boats can be drawn safely out of the water onto the tiny beach. Staffa stretched ahead of me for another half a mile, but the lumpy green ground made it impossible to cover any distance quickly. I was disappointed not to have time to investigate more and seek out the ruins of a stone building, thought to be a folly dating from the 1820s. Hearing a commotion, I turned to see a group of naval reservists fanning out from the top of the stairway in pairs. I suddenly realised that the few members of our party who had been close by only moments earlier had now all disappeared. With the minutes ticking away, I ran across the island and saw the boat ready to leave. Even though I thought it would have been nice to get stranded, I didn't believe they would actually have left without me. I scrambled down the makeshift stairs as swiftly as I could without risking a fall and made it back at 1 o'clock on the dot. No sooner was I onboard than we sped off down the coast. From the sea, the pillars reminded me of corset ribs squashed between the overhanging mass drooping down from above and the elephant-grey column stumps rising out of the sea. We rounded the tip of the island for one last look at Fingal's Cave and The Colonnade. I was desperately snatching my last moments with The Wondrous Isle. I stared back at it. From a distance, Staffa became a green-topped slate slanting down into the sea. We charged northwards to the Treshnish Isles with the skipper pointing out Bac Mor otherwise known as the Dutchman's Cap, which could easily be mistaken for an aircraft carrier on a misty day. Our destination was Lunga, the largest of the group. It appeared almost as two islands in one with a low plateau occupying the south and a rocky northern half rising to a peak some 100 metres above sea level. We slowed down, slipping into a seemingly private blue-green lagoon. A brilliant white yacht drifted by. It was as though we had entered another world. The scene was that of a tropical paradise. It was about 1.45pm as we began the delicate landing operation by fetching a wooden pontoon moored offshore. The skipper had to manoeuvre it and his vessel into place by the rocks. We slowly left the boat, climbing onto the pontoon which we were told could support no more than two people at a time. The girl helped us all off and we picked and slipped our way over the seaweed-covered rocks to larger, drier boulders and finally dry land. There, a narrow footpath led up the grassy hill. The skipper had warned us to ignore the first puffins we saw and continue along the path around the west side of the island. The less intrepid members of the party including Bettty and Jim soon stopped, content to sit in the sun and watch whatever birds flew past. The more adventurous of us trekked up into the cliffs at our own pace and reached one of the colonies. I think there may have been other sites further along, but this was a revelation in itself. None of us had expected anything on such a scale. There were thousands of birds in various combinations of black, white and grey. Faced with a cacophony of constant squawking, we approached them quietly and separately, first looking for the best vantage point, then choosing our own strategy to see how close we could get. A young couple lay flat out at the edge of the cliff and waited with their camera. A bird watcher hid himself from view in a natural dip in the ground. A middle-aged lady and myself slid around on the grass between the rocks, wary of frightening them away. Guillemots huddled together in groups of between one and two hundred, each cloaked in black, pressing its white belly against the cliff face. Lone fulmars waiting for their mates guarded their rocky nests. Puffins waddled along the grass, alert to all around them. One chased a large white feather until it blew off in the wind. 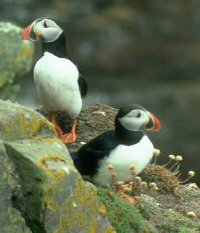 Although this picture of puffins was taken by North-West Frontiers on Handa Island, just off the mainland north of Ullapool, it still gives you an idea of the great sights which can also be seen in the Treshnish Isles. They seemed to arrive out of nowhere, manoeuvring in the strong air currents, then swiftly landing on the rocky ground. After scurrying about like wind-up toys in a Duracell advert with their heads constantly revolving, they would manically dive off the cliffs again. Fascinated, I must have stayed for over an hour, almost losing track of time. The sea was holiday brochure blue spotted with flakes of Persil white. Arching around on the western horizon, Coll and Tiree were clearly visible which was far different to the cat and mouse game I played with them yesterday in Calgary Bay when the mist rolled in. Once I had resigned myself to leaving, I began to retrace my steps along the narrow path. I turned a sharp corner and came face to face with a puffin standing on a rock just a metre in front of me. It was like a little furry toy. I felt that I could almost have reached out and touched it. Several of its companions overlooked us as we stood scrutinising each other. Conscious that we'd only been given a little over two hours, I slowly uprooted myself and snook off down the path, turning back to see if they were still watching me. Further along, I met a plumpish middle-aged lady from our party who had been chatting to the couple from Peterborough on the boat. I explained how they had offered to take me in their car, as we were staying at the same B&B. She was interested in hearing about my grand tour, but I didn't want to waste too much time going into detail as there was still the east coast to explore. It was a pity we weren't there long enough to climb the hill or reach the flat half of the island. I could easily have spent a whole day here. I scrambled around to the other side of the island which faces the ever-present Mull. In the bright sunlight the views were superb with visibility up to 45 miles. The skipper said later that it was the best day they'd had in ages. The clouds had been all but banished to the outer ring of the sky. Iona lay to the south with the three humps of the Paps of Jura peeping over the low-lying Ross of Mull. It was a strange jolt to suddenly see them, like looking back in time to distant friends. As the panorama provided me with a taste of things to come, I thought of the journey ahead. The finger of the Ardnamurchan Peninsula stretched out in the deep Atlantic blue pointing to Eigg, Rum and was it the mountains of Skye I could see behind them in the distance? I longed to be absorbed in the timelessness of the island, but the minutes were ticking away. I scampered across the uneven terrain, half-running through the long grass. I had to be back by 4 o'clock otherwise I could have fulfilled my wish to stay forever, perhaps turning into a rock myself. I looked back to the slanting shape of Staffa adrift on the sea like a leftover piece of a jigsaw puzzle. Back to the hill overlooking the boat I raced. A host of skerries dotted off the north-east coast appeared as giant's stepping stones enticing me back to Mull. Some of our party were picking their way back over the rocks like bounty-hunters, their cameras no doubt filled with souvenir snaps. I stumbled down the hill, hoping not to be last this time. The rising tide had passed the seaweed line and it was easy to get back onto the pontoon. I found that everyone else had already made their way onboard and so we left for Mull immediately. Sailing north through a myriad of tiny islands, we spotted a couple of seals basking on the rocks. Then it was past Fladda and on to the very tip of the Treshnish Isles group. The last two islands offered us the ruins of ancient castles and natural arches weathered by the sea. As we turned to enter Loch Tuath, I looked back into the sun. Shadowy islands lay scattered on a silver sea. We chugged along between Mull and Gometra, stopping once again to watch a couple of common seals on the rocks with a companion poking its head out of the water like a periscope. Behind them, a waterfall poured down into the sea. All too quickly Ulva Ferry came into sight, dwarfed by the majestic peak of Ben More standing in the background. Finally the girl came around for our fares and the trusting islander concept of not paying in advance seemed to make sense at last. We all handed over our �17.50 knowing that it was well worth every single penny. The little boat and its crew delivered us safely back to dry land right on schedule at 5.30pm. 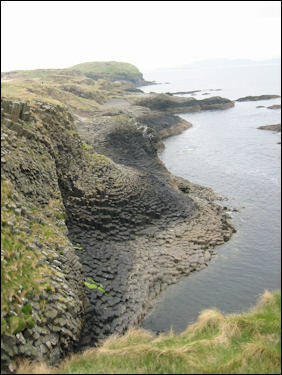 Having once owned Staffa and lived on Mull, Alastair de Watteville is the ideal person to produce a book on this unique island. It is full of colour photos, drawings and information that you probably won't find anywhere else without doing a lot of research. After my trip to Staffa, I bought this book as soon as I saw it. What a magnificent souvenir! Dimensions: approx. 12 x 8 inches.